Finding the right college can be frustrating, especially with so many great colleges out there. During my career as a college admissions counselor, I’ve visited campuses all across the United States and I can confidently tell you that there’s a college that’s right for your student! But some parents worry. 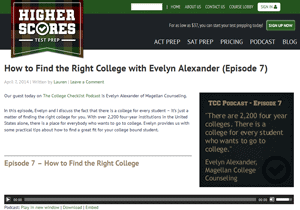 That’s why Higher Scores Test Prep interviewed me for their podcast. They asked me for my best college search tips, and to discuss how to find the right college that “fits” your student. What you’ll discover is that it’s not about applying to a college that simply sounds great. So what is it about? Read on and listen to the podcast to get the full story.